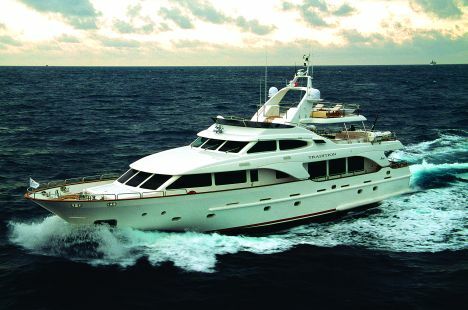 The Azimut-Benetti Group built the 99' Benetti Tradition with a semi-displacement hull so as to complete its range of composite motor yachts. Designed by the architect Stefano Righini, this yacht has three and a half decks, with plenty of room for relaxation in open air and cabins for guests and crew in the lower deck. On the upper deck there is the helm station, equipped with state of the art navigation instruments and a leisure area with sofa on the full breadth of the superstructure. Aft of the helm station there is a roomy open area offering a dining space fitted with a round table, a cocktail cabinet, a semi-round sofa and two coffee tables. Aft there are the tender and davits for tender haulage and launching. The fly bridge includes the auxiliary helm station fitted with all the steering and electronic controls and a spacious sundeck aft. 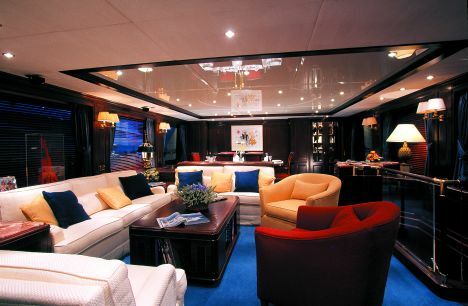 On the main deck aft there is an open air space partially covered by the extension of the upper deck and furnished with a three-seater sofa and a dining table with four chairs. The interiors designed by the architect François Zuretti feature fine woods such as mahogany, satin-cherry and teak, in addition to Carrara marble and granite, combined with blue and cream fabrics. From the cockpit one reaches the main salon, furnished with an L-shaped sofa, a coffee table and ample seating for guests. Forward of the salon there is the dining area, with a table for eight and the duly separated galley. On this deck there is a bathroom for guests, with toilet and washbasin, while the owner's cabin, which is located forward, has a double bed, a dressing room and a spacious bathroom. The latter is divided in two separate rooms, one completely fitted with all the necessary accessories for personal hygiene and the sanitary fittings, the second houses a Jacuzzi tub and a dressing table. The cabins on the lower deck may be reached from the main deck through three stairways. The full beam VIP cabin is aft. It is fitted with a queen size bed, a small sofa to port, a study corner to starboard, a dressing room and ensuite bathroom. Amidships on the lower deck there are two twin guest cabins with ensuite bathroom. The crew quarters are forward and include a small dinette with a C-shaped sofa and three cabins for five people, each one with ensuite bathroom. The bow area of the Benetti Tradition houses the roomy garage whose lift-up hatch turns into a spacious sundeck, which may eventually serve for storing another tender and even a jet ski, as well as a variety of other sports accessories. For further information contact: Gruppo Azimut- Benetti; via Coppino 104; 55049 Viareggio, Italy; tel. +39-0584 3821; fax +39 0584 396232; website www.benettiyachts.it; e-mail info@benettiyachts.it. Displacement at full load: 314,978 lbs.